My morning commute certainly wasn’t the only thing new and different about my commute today. My evening commute brought me on board Rohr 1133, where Metro was presumably testing a few things. Unlike on Breda 3283, where the changes were designed for passengers, the changes on 1133 appear to be designed more for Metro’s internal use than for the passengers, though passengers certainly benefit from some of the changes as well. 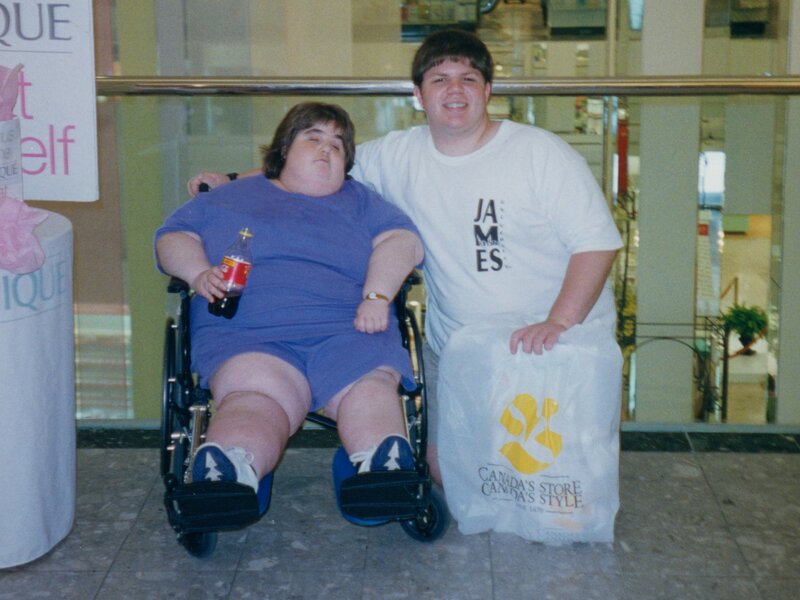 And now my opinion that the lean rests are a bad idea is also based on actual experience. It seems that January is the month for the Red Line to get all of Metro’s test cars. You may remember that I got Alstom 6105 on the 17th. Well, this morning, I got Breda 3283, which, you may recall from an earlier Journal entry, was being used to test a new seating pattern. Let me quickly refresh you: All of the side seats next to the center doors, as well as the two rows beyond those on both sides of the center doors, were eliminated in favor of sets of six side-facing “cloth-based” bus seats. Metro also removed eight seats from the blind end of the car and installed leaning rests for standees, ran a ceiling grab bar back into the blind end (which normally has no grab bar, making it a no-man’s land for standees), installed spring-loaded metal “straps”, removed all the windscreens except for those around the center doors, removed the railfan window seat near the cab, and added two three-handled grab bars at the cab end of the car. 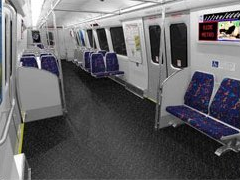 They also recarpeted the car in the same style used on the newer rail cars, and changed all the seat cushions to the “colonial burgundy” color. Because of that color change, doing away with all the orange that Metro loved so much during the 70s and 80s, it’s somewhat ironic that the new bus seats that were installed were what color? That’s right – orange. Then Metro also slightly refurbished Breda 3282, which is 3283’s mate, as well. 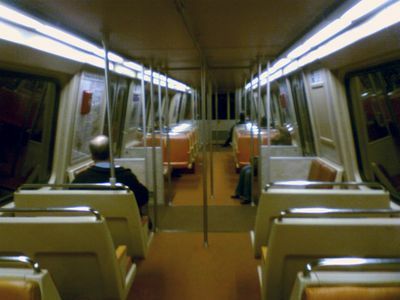 All of 3282’s seat cushions were replaced with the “Potomac blue” color, and it was also recarpeted. However, 3282’s floorplan was unchanged, as it is likely a control car in Metro’s experiments. 3282 has been refurbished at least since late September, as Katie and I saw it on the Green Line at Fort Totten with the blue seats on that weekend that she was in town. And the second day of the consulta went equally well. The second day of the consulta went just as well as the first. We had a slightly smaller crowd, but it still worked. We couldn’t get into the Frederick Cultural Arts Center right off the bat on Sunday due to the fact that a church had services in there at 11:00, so we started out at the Frederick Coffee Company for the first hour and some. There, we discussed affinity groups, protest tactics, and even “protest fashion”, which was kind of like What Not To Wear: Black Bloc Edition. Then we went over to an area about a block away from the Arts Center, and had lunch, courtesy of the local Food Not Bombs. There, they had a selection of vegan food, as well as what’s called freegan, meaning it’s stuff that was obtained for free after being cast off by the primary purchaser. 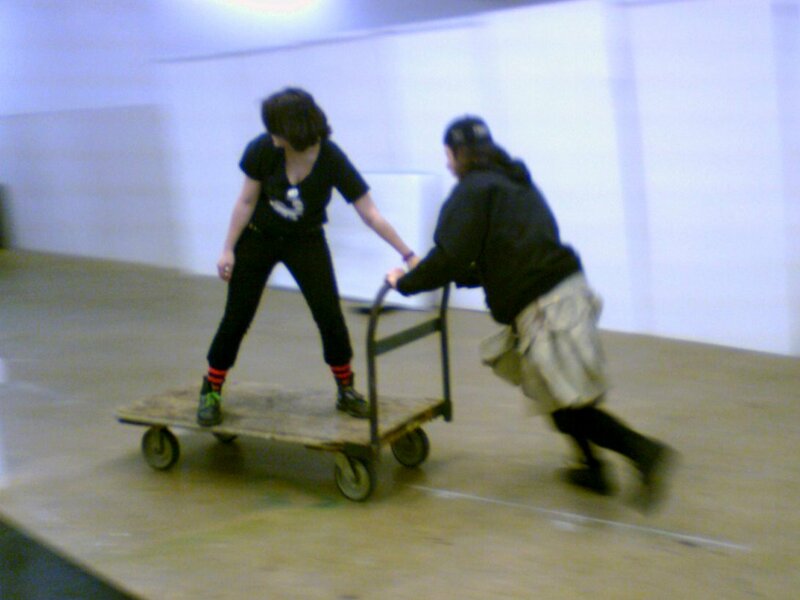 From there, we got into the Arts Center, and prepared for a workshop on police tactics. However, before that got going, while everyone was setting up, Jeff and Maddy had a chance to be wacky with a cart that was in there. Day one of the “Unconventional Action” consulta went very well! However, with Denver and St. Paul being out of range for many of us (I have neither the time nor the funds to go), it also worked well for things to apply in that hotbed of activism that’s right in our own backyard – our nation’s capital, Washington DC. We discussed a lot of stuff, too, mostly related to protest tactics and community organizing. We started with discussion on how to combat gentrification (with handouts! ), took a break, and then moved onto discussion about the logistics of the RNC and DNC. Bridges, hotels, locations of various buildings, perimeters, etc. Very interesting stuff. And lots of handouts! I like handouts. This is the entry I’d hoped not to ever have to make. 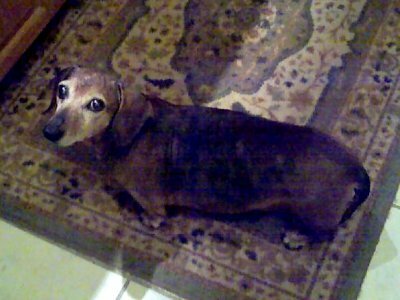 Sad to say, Greta has passed on at the age of 13 years and 11 months. She died peacefully at home. Everyone whose lives she touched will miss her dearly. Greta was quite the dog. She was very protective of the family, barking loudly and continuously at anyone who would visit that she didn’t know. She knew the drill when the doorbell rang, too – she would be the first at the door, barking her little head off. She would also do the same thing if a doorbell would sound on the TV. But she would always give a little doggy smile whenever she saw us. She also knew how to give love and receive love, as Greta was Mom’s little baby, always small enough for Mom to hold in her arms. The two of them had a great time, too, as they would sit and watch television together, and Greta could always be found near Mom in the house. And as all domestic dogs should be, Greta was spoiled rotten, getting just about anything she wanted. Talk about a great life. Yes, as of this writing, the Lappy is officially running Ubuntu Linux. So this is exciting. My Linux experience is presently quite limited. The antiquated computer at the Infoshop runs Ubuntu Linux, and so I’ve gotten some experience there with Linux. Plus I’ve also had some (and by “some” I mean “very little”) experience with the Unix command line, which Linux also uses, both at the Infoshop, and in the Mac OS X training class I went to up in Philly last November. It seems like it’s a pretty good system, and once I figure out how it works, it should serve me well. After all, I’ve learned how to use Mac OS X, so I can figure out Linux. At first glance, Ubuntu Linux kind of reminds me of Mac OS X a little bit. And Greta’s back home again. Well, we can all now breathe a sigh of relief. Greta’s back at home, and doing better. She’s on a special food for kidney patients, and she’s drinking her water. But at least now she can sleep in her own bed again, because the vet’s office stresses Greta out tremendously. Always has, too. Is Greta totally out of the woods yet? Probably not. But at least she’s improved to the point of being able to return home. First of all, let me say I had my first Alstom ride on the Red Line this morning. The Red Line is still mostly Rohrs, though as of late, it’s had quite a bit of Alstom-manufactured cars coming in. However, up until today, I’d never gotten an Alstom for my regular Glenmont-to-Dupont-Circle-and-back commute. So this morning, I’m at Glenmont, waiting for my train on the platform. Alstom! And not just any Alstom, either – I got Alstom 6105, which is part of the first pair of cars to have “resilient” flooring rather than carpet. I first discussed these cars back in the early part of December. Recall back then that my reaction was neutral to slightly positive. Now that I’ve ridden the non-carpeted pair, I’m confident that Metro can shed its carpet and still do just fine. First of all, this particular color doesn’t show dirt very well. There was some crud on the floor, but the gray color with little flecks in it didn’t make it too obvious, therefore I had to actually look for it. It’s just about at that happy medium to where dirt gets hidden, it seems. Then of course to clean this you just have to run a mop over it. Additionally, it harmonizes well with the remainder of the decor, which didn’t change. 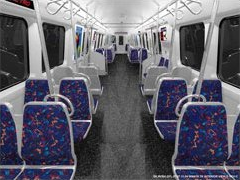 These Alstoms still have the white walls, white ceiling, white seat frames, gray armrests, and “Colonial Burgundy”, “Potomac Blue”, and “Chesapeake Sand” colored cushions. One thing I was concerned about was sound, and I was pleased to say that I noticed no major differences in noise levels with the non-carpeted floor vs. the carpeted floor. So I think that this “resilient” flooring thing is in the end probably a good thing, as long as Metro decides to go with a color that doesn’t show dirt, and also works with all the various color schemes they have come up with or might come up with in the future, especially since this flooring is supposed to last a long time. Thus that gray color they picked here is probably a good choice. Now let’s talk about this… for a very small amount of oil, you’re producing three times more greenhouse gases than conventional methods, and destroying one of our natural treasures? Um… NO! The Canadian province of Alberta is in possession of a rare natural resource known as the Alberta Tar Sands, which can produce a very small amount of low-grade petroleum only after undergoing an extremely energy intensive and wasteful process. This process produces three times as many greenhouse gases as conventional oil production through extreme localized degradation, and is being referred to as the most environmentally destructive petroleum endeavor of all time. On his first visit to the U.S. the Canadian Embassy will host a talk by Ed Stelmach promoting the extraction and use of Alberta Tar Sands. It was quite a festive event, too. RCDC was in attendance, as was my usual group of friends that I see at protests – Jeff, Luke, Maddy, and Olga. I also got to see Isis. And Brendan, a coworker of mine from Food & Water Watch, was also in attendance. Plus there were several people dressed in polar bear costumes, and a number of people played “O Canada” on kazoos as we protested Ed Stelmach’s visit to DC. 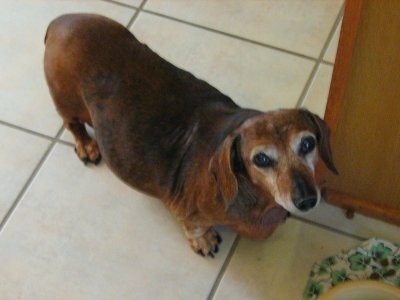 Many of you know Greta, our brown dachshund, who has been part of our family since 1994. In fact, you may recall just yesterday, I was delighted to receive a picture of Greta from Mom. Unfortunately, when a dog reaches an advanced age, though (Greta’s 13, almost 14), things don’t work as well as they once did. Greta had to be taken to the vet today, and it turned out to be some serious kidney problems. So Greta’s staying at the vet for the next two days for some serious treatment, getting all of her fluids in harmony again, and seeing what the deal is. I hope Greta makes it through this. Meanwhile, if you could also think nice thoughts about Greta as she gets through this rough time, I would really appreciate it. Yeah, Greta is perhaps the one I miss most being in Maryland now, as Greta, unlike the rest of them, doesn’t use the phone. Brakes and rotors and lights, oh, my! Well, the Sable got its Maryland inspection today and failed it. However, everything that was wrong with it could be fixed, as I expected. I knew I needed new brakes, but I didn’t think I needed both front and rear brakes at the same time. I figured just rear. Then I also needed new rotors. Greeeeeeeeeat. Meanwhile, a couple of lights were out on the car, and they’re going to fix that as well. However, what surprised me was not what didn’t pass, but what did. While I was in Philadelphia in November, one of the hinges on my back window cracked through, rendering it useless. The window was in no danger of falling out due to several other attachment points’ being sound. I discussed it with Dad and sent him a photo, and he said it was a fix we could probably do ourselves, and it would be fairly easy to do after we got the part. But in the short run, while I was still in Philly, since the loose hinge was rattling, it was highly annoying to hear while driving. And the idea of a three-hour drive back to Maryland with that rattling the whole way was more than I was willing to handle. So I made a quick fix on it right before I got on the turnpike to go home – I went to a convenience store, bought a small roll of duct tape, and taped it all back together. And it held. I didn’t have to hear that thing the entire way home. And now, I still haven’t fixed it. And that part passed inspection. I was waiting for them to say something about that, and nothing.